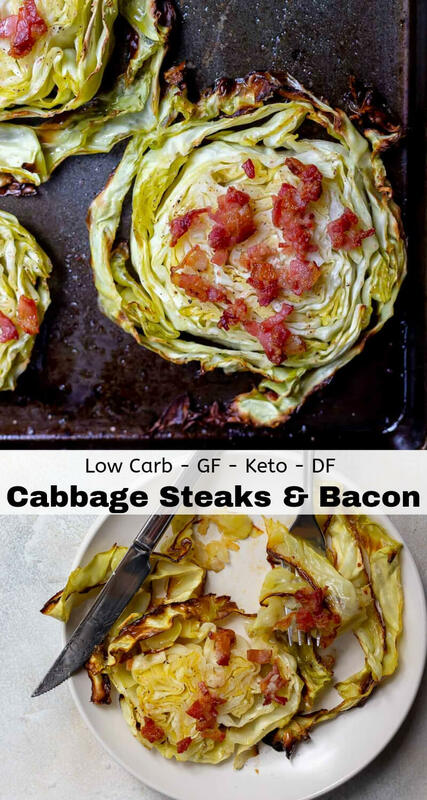 Roasted Cabbage Steaks with Bacon is a simple side dish that is Keto – Low Carb friendly. 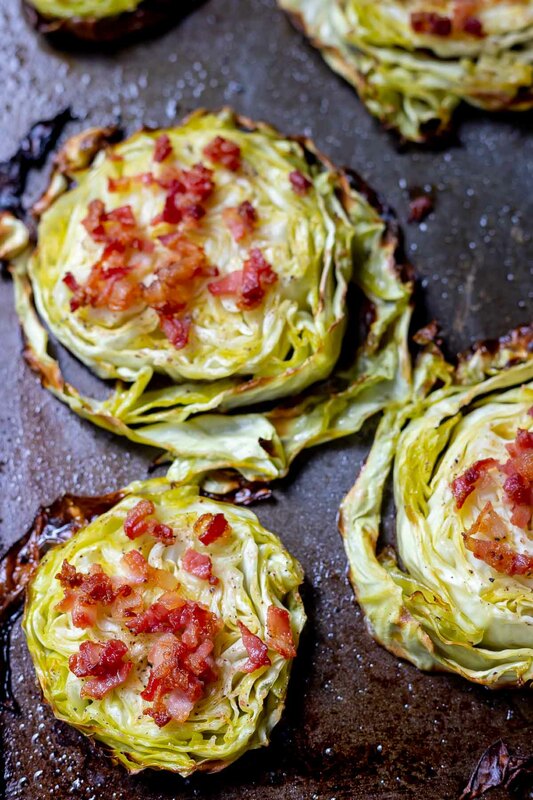 Oven baked cabbage gets those crisp caramelized edges that taste amazing. 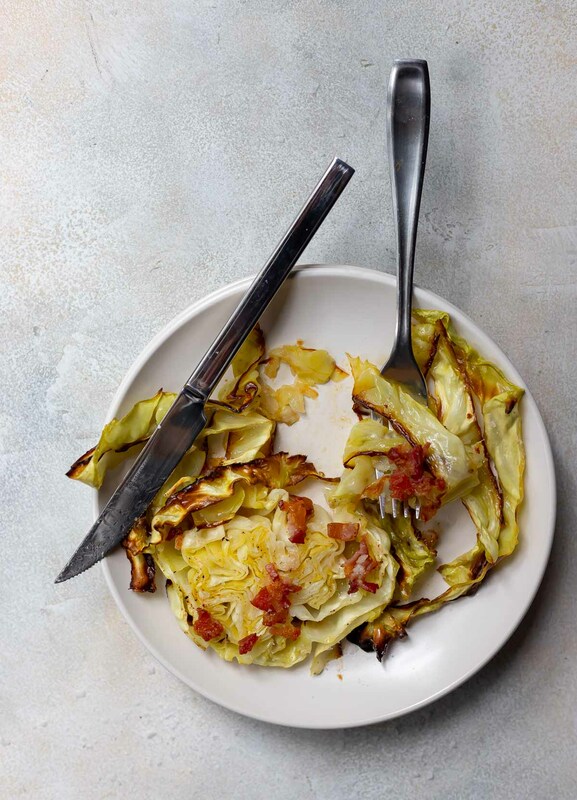 This roasted cabbage recipe is so easy and delivers a ton of flavor. The crispy roasted edges are my favorite part. In fact, I usually roast my cabbage even longer to the point of being charred. Feel free to roast longer or shorter depending on you personal preference. Most veggies are improved with a good dark brown roasted color. And most foods in general are improved with bacon. 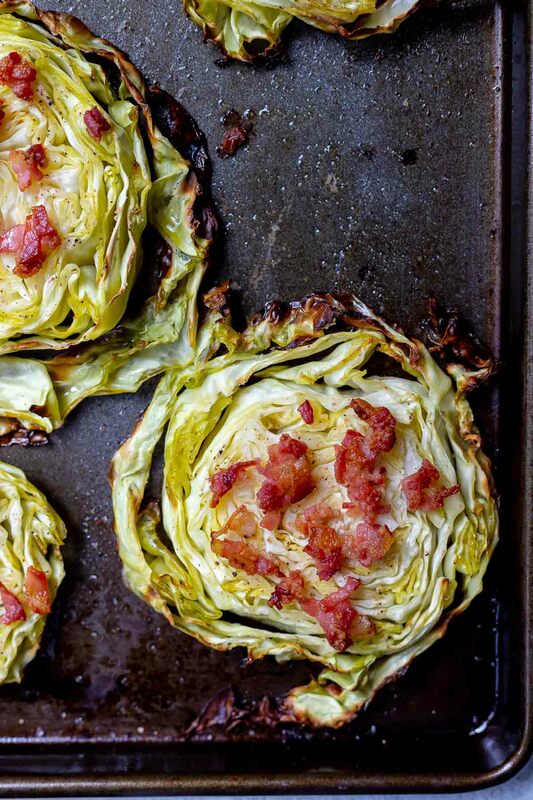 So these Roasted Cabbage Steaks have two extra delicious points. Heck yes! Cabbage is one of my favorite vegetables. 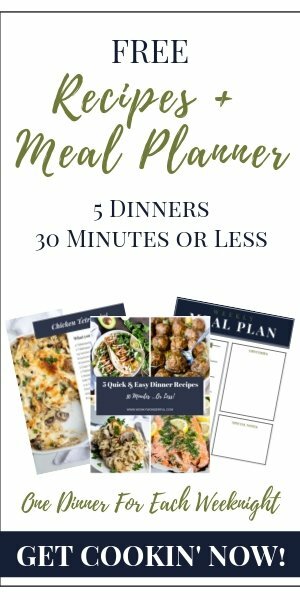 It is versatile and takes on the flavors you add to it. Cabbage is low calorie, high fiber and high in vitamin C. It also has very low Net Carbs, so it is perfect for the Keto diet. And . . . bacon in moderation is good too. Easy Vegetable Soup: Double up on those veggies, vegetables as a main dish and a side dish. Baked Lemon Pepper Chicken: I mean, you could serve this chicken dish with just about anything. Cabbage steaks would be great with this chicken too! Garlic Rosemary Whole 30 Meatballs: A match made in heaven and healthy too. This would be a filling meal and pretty much fits into any diet. Cheesy Ranch Chicken & Broccoli: This would be a wonderful low carb pair. Stuffed Sausage: Cabbage and sausage are like BFF’s for good reason…they are great together. 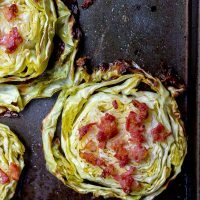 Slice cabbage into 1 inch thick rounds. Transfer to a greased, rimmed baking sheet. Brush cabbage with olive oil. sprinkle with salt and pepper. Roast for 30-35 minutes for medium brown edges. Top with raw bacon pieces.